We're all looking for healthy treats. Have you ever looked in your kitchen for something to eat and well.... nothing did it. Either you felt it wasn't good for you, didn't feel like a treat or just wasn't going to satisfy you. 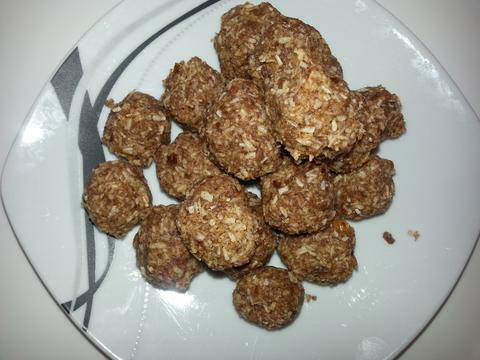 In the past I've written about my almond ball recipe which I love but this recipe is packed full of healthy coconut. Coconut has been shown to help stabilize blood sugar, lower cholesterol and build the myelin sheath in the brain. It helps improve digestion, regulate hormones, increase thyroid production, increase metabolism and stave off memory loss. So how great is it that it also tastes delicious. This easy recipe can be made in either a high speed blender or a food processor. My guess is that a nutribullet or magic bullet would do the trick also. You can add the optional items or not. For this batch I added all the optionals and it tastes delicious but if you have a nut allergy do not add the nut butter. Put all of your ingredients in your blender or food processor and blend until mixed all together. Make balls (or bars for my clients that prefer things in that shape - you know who you are) Refrigerate and enjoy. Note: they do not need to be kept in the refrigerator but they set up good in an hour in the refrigerator. Let me know how you like them below.